It was January 19, 1975, a cold front was in full force and the temperature was dropping fast but the wind was blowing even faster. Snow blowing in the wind at about 60 miles an hour and the temperature was bouncing around 20 degrees. I wasn’t even going to look at the windchill charts. It was daylight and cloudy but I sure wasn’t interested in saddling up and going to check the ranch conditions. We had 1200 yearling steers scattered on 50,000 acres but they had been there a couple months and were settled in and located with plenty of feed and some nice canyons to hide in from the wind. I knew there wasn’t much I could do for the yearlings but the water conditions were always a priority and plumbers have to work in all weather conditions. I had just turned boss of this outfit and I was well aware of my responsibilities, but I didn’t have anyone to tell me how I was to get it done. So I decided my preferred method of saddling a big stout pony and striking out would be Plan B; the ranch pick-up with the roll-up windows, heater and four wheel drive. I loaded my dog, Sis, and my other necessary tools and headed out feeling mighty cozy in a most horrible winter storm. Being young, lipping full of energy, wanting to leave the house full of an expecting wife with a coming two year old son, I was looking for a little freedom and quiet time. My wife Anne, was thinking about braving the storm with me and leaving Wilson in charge of the house. He was pretty much in charge anyway. The reason I remember all the details so well is that I was turning 30 years old on that day. I was on the short side of my circle and headed to the house feeling good as all was well. The last tank and well to check was right below Guadalupe Pass and at the North end of the ranch, certainly one of the windiest parts. When I checked the water level in the open topped tank, I was surprised to see a full grown golden eagle with his wings spread floating in the tank. He was still alive but looked very chilled and not able to escape his water filled trap. I found a mesquite limb and fished him out. He lay on the ground unable to stand up. So I picked him up and carried him to the windless side of the tank and set him right side up. He was trying to sit up, but I could tell his strength was about gone. He was still trying to stay alive but the cold chill of the wind and being totally wet was making matters worse. I was chilling fast also, so I decided we needed to get in the pick-up and turn the heater up. I set him on the floor board under the heater and I got in on the driver’s side. He looked much relived to be inside the pick-up and I could tell it was going to take a while to get him warmed back up. I thought I might as well head to the house. Everything was in good shape as far as the ranch was concerned and there wasn’t much else I could do for Mr. Eagle. My dog, Sis, was sure put out when I made her ride in the back of the pick-up and gave that bird her spot up front. There was room in the front for all three of us, but I thought it might get crowded quick if the eagle or the dog started fighting to see who was going to ride shotgun. I didn’t want to do any refereeing as I knew how serious my dog was and I didn’t want her to be taking advantage of this poor hyperthermia-fied eagle. We had been driving about thirty minutes and the eagle was really coming around. He was standing up preening his feathers back in shape, fluffing up and looking mighty regal. He was feeling so good that he decided to jump up in the seat and have a look around. I couldn’t believe how comfortable he was and looked to be back in a full healthy condition. He was riding shotgun, standing up looking around like he had been at this job his whole life. I had turned the heater off and it was still hot in the cab so I reached over and rolled his window down. It never bothered him. He acted like he was tickled to have a ride. We rolled for another thirty minutes and he never acted the least bit uncomfortable. I was riding along visiting with him and asking questions about where he was from and where he was going, but he never made a move except to crane his head at a funny angle and look at me like I sure didn’t know much eagle talk. He decided the weather outside looked a little more comfortable so he jumped up on the open window sill and perched there for a spell looking around. Home sweet home must have been beckoning and he raised his tail and shot a stream of white eagle guacamole all across the seat and into my lap and flew out the window. I thought that was a small thanks for such a large favor. But he couldn’t fly far and he bit the dust at about thirty yards. 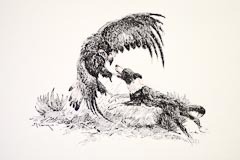 This was the chance my dog, Sis, was looking for and before I knew it she was all over that eagle. I got the pick-up shut down and went running to the fight hoping my dog didn’t do much damage to the eagle. Before I got there the eagle was in full control and had my dog in his claws by both cheeks and she was hollering as loud as she could for help!! I had my hands full prying that eagle off my dog. But finally I was able to separate them and the eagle looked plenty much in charge. My dog was a little hesitant to jump that eagle again after I got them separated, but I thought the eagle might need some more rehabilitating, so I loaded him in the back and tied him with some baling wire to the tool box and put Sis up front. After I saw what he did to Sis’s cheeks, I thought that would be best. But it didn’t bother that eagle. He jumped up on the headache rack and rode home like it was his job. He never fought the wire or the ride home. I sure was in a hurry to get home as I wanted Anne and Wilson to see my new pet. They were leaving to go visit grandparents and I wanted to get there before they left, but no luck. I entered the HQ compound completely unnoticed much to my disappointment. I unloaded my feathered cargo and attached him to the picnic table. He sure was a fancy centerpiece and I was standing back admiring him when my neighbor drove up. I could tell he wasn’t as impressed as I was about my new friend. He asked me what I was doing with that buzzard sitting on my picnic table. I figured Mr. Eagle must be hungry after such a cold swim, so I went to the walk-in cooler and got a kidney from a beef we had just butchered. I figured if he ate that kidney he would be worth keeping around. I set it down at his feet hoping he would eat it, but if he didn’t I would understand and go get him a better cut of meat. He looked at it as if to say, “Well I can’t eat it with my hands tied.” So I took my knife and cut a piece of kidney and handed it to him on the point of my knife. He checked it out and promptly ate it. He proceeded to eat the whole kidney to my complete amazement. I went to get the other kidney and offered him some more, but he was full of kidney and refused any more. He looked plenty happy, so I visited with my neighbor and did the evening chores, before I went inside. As my neighbor was saying good-by I checked on him and he was alert and comfortable. The next morning the storm had passed and it was quiet outside. I was glad to see my new friend so content. He looked plenty healthy and healed from his bathing ordeal. I went inside to get him some more meat as he had eaten the other kidney, but as I was returning with breakfast, he spread his wings and flapped a couple times and was gone, breaking the baling wire next to his leg. He circled the compound twice as if to say good-by and was striking out for new horizons. I bet he never took a bath again !! Comments for "Eagles Hate to Bathe"
I enjoy your stories SO MUCH! It is almost as much fun reading them as it is hearing you tell them. Almost, but not quite. Be well and keep talking. Karen McLain on September 26, 2011 What a great story Mike! I’ll think about it again with tomorrows morning cup of coffee! Goodi on October 23, 2011 I finally got high speed internet so I can actually read your stories now. Love it & can really visualize it.